Unless otherwise specified, I do the graphic design and layout for all of my games. This page features client and personal work that I feel is particularly representative of my style and abilities. I am generally available for freelance graphic design and layout work, please contact me here to make an inquiry. Thanks! Cover title, multi-use logo and icon set for this Dungeon World hack of heroic kobolds saving their village from marauding adventurers. Written and published by Steve Wallace. A multi-use logo design and set of icons for this game of making art through hip hop. Written and published by Quinn Murphy. Cover design and interior layout for this roleplaying game of mud-and-dung dark fantasy adventure. Designed to visually reference full-size RPG books of the 80s and early 90s, but with a textual flow that keeps each spread visually remarkable and legible typography. Written and published by Ron Edwards. A set of supplementary faction-creation cards for the roleplaying game Mars Colony: 39 Dark by Tim Koppang. Printed via DriveThruCards.com. Celebrating Kelley & Arnold's wedding. Postcard wedding invitation. Otter art provided by clients. A series of fantasy adventure modules in Pathfinder Adventure Path, published by Mór Games. Cover design, interior layout and Path-specific character sheets. Published in softcover and as PDFs. Adventure Path custom character sheet sample - 4 pages that fold to 8-page 5.x"x8.5" pamphlet. A title logo, interior layout, play reference sheets, and cover design (with integrated illustration) for this game inspired by the Japanese Anime sub-genre of "emotional teenagers and giant fighting robots". 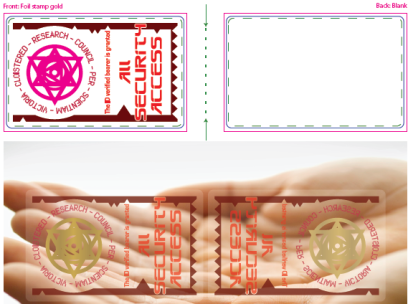 I also designed a graphic "access card" with clear and foil reflective elements, a reward for some Kickstarter backers of the game. The graphic elements and typography were chosen to create a sci-fi/near-future feel for the text, without sacrificing clarity or ease of use. 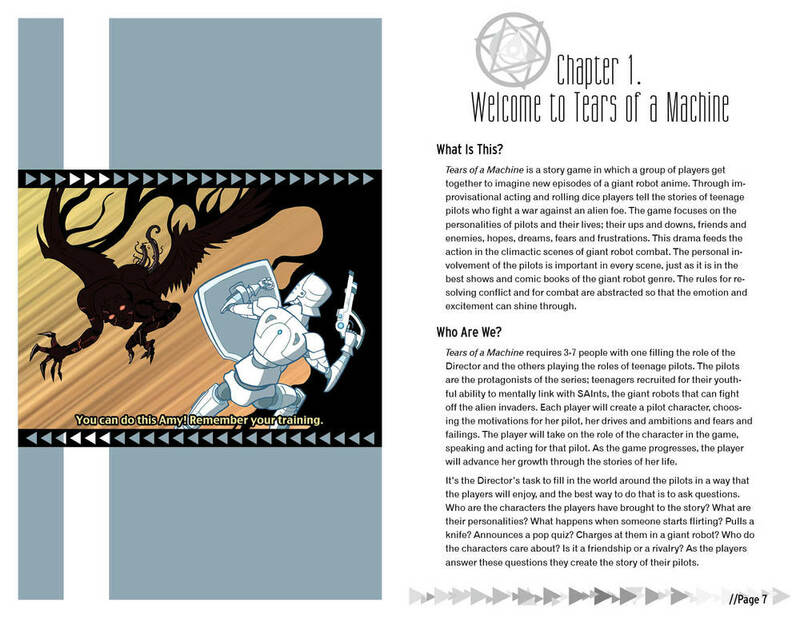 Tears of a Machine is a role-playing game by Russell Collins (visit it here). All of the illustrations seen here are by Jennifer Rodgers (visit her here). A visually striking cover, with resonance to the Lebanese flag, that asks the viewer to investigate the meaning of the title. The stark, bold color choices contrast with the found image of graffiti found in Beirut in order to both arrest the viewer and draw them in for more. Client testimonial: "Nathan did an amazing job with one of the trickiest design challenges I've ever inflicted on a layout person - no flash, all punch.﻿"
I also designed a primarily reading text that reflected the first book in this series (Spione, layout design by Matt Snyder), with clear navigation aids. The text is a historical/social account, with one chapter containing a game that can be played using the rest of the book to inform the players. In addition, I created clear diagrams of complicated relationships between different factions and parties involved with the Lebanese civil war at different periods in time, as seen in the spreads below. Shahida is a book-and-game by Ron Edwards (visit it here). Integrating new annotations into an existing text (see the Kickstarter project here). The author wanted to preserve the original layout as much as possible, while providing extensive notes on the existing material. We decided to maintain the original text on the left-hand pages while providing the annotations on the facing right-hand pages, much as an interlinear translation/teaching text places the same content in two languages on one spread. My typography decisions were made to both integrate with the existing text and communicate the contemporary nature of the annotations. Where the annotations flowed onto the next page, I grayed-out the same facing page on the next spread in order to keep later pages consistent. I used non-standard page numeration in order to maintain the page references in the original text (one page number applies to the two-page spread). Sorcerer is a game by Ron Edwards (visit it here), and the original layout was done by Paul Mason. Envisioning the text of Alan Lightman's Einstein's Dreams as a promotional poster (top) and book (cover and interior spreads below) in a fashion that conveyed my personal interpretation of the multivalent text.